I am often asked, ‘How long will it take to recover?’ There is no straight forward answer. It’s different for everyone. A lot will depend on how long you have been abused and what was done to you. 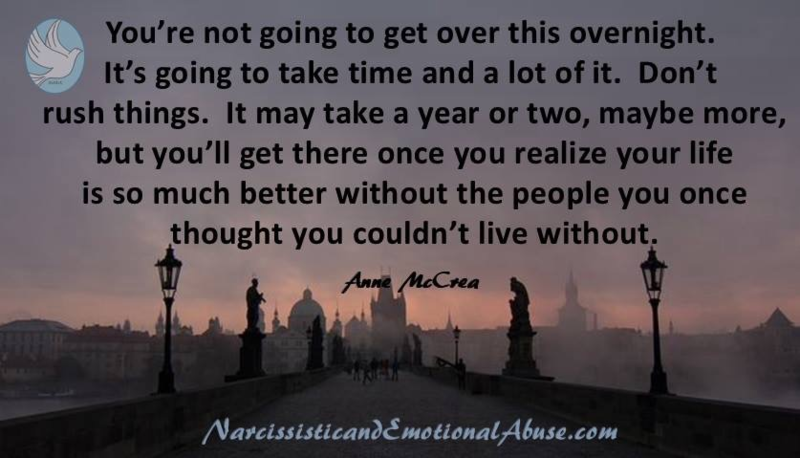 Recovery from emotional abuse is going to take a lot longer than getting over a normal relationship. Some experts will say that it takes at least two years to recover from abuse, but for many, it can be much longer. 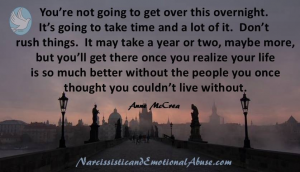 I believe that to move on, you must physically get away from the narcissist in your life. It’s a bit like a wound that won’t heal if you keep opening it. No contact works but it is difficult. It is extremely tough to implement no contact if you have not accepted that the relationship is over, permanently. It should be noted that not everyone will go through these emotions in this particular order. There is no time limit on how long each stage will take nor is it necessary to go through each one of them. ‘If only’ is an expression that we must forget. ‘If only I had recognised the red flags sooner’, ‘If only I had of acted differently’. Nothing you could have said or done would have changed the outcome. They are who they are. What’s done is done. Never be afraid to seek the help that you need. There are those who will find that therapy helps. Some people suffer from PTSD because of what was done to them. This can be treated with the correct help and support. Others will find that going on anti-depressants for while may help. You have got to do what is right for you. Realize that you are not the person the narcissist made you think that you are. You are much stronger than you think you are. Surround yourself with people who care. Talk to people who understand what you are going through. Don’t expect people who have never been subjected to abuse to understand. They won’t. You will find those who understand your pain are those who have been there. It is essential to understand NPD and rid yourself of the belief that any of this was your fault. You need to be able to put the pieces of the puzzle together. Understand that the narcissist is a dysfunctional human being, they were before they met you, or in the case of a parent, before you were born. Understand the immorality and wickedness that characterizes their behaviour. You may feel that you will never be able to trust anyone ever again. You want to build walls to protect yourself and keep people out. Hard as it may be, try not to paint everyone with the same brush. There are some good people out there. There are some people who want to see you happy and not be the cause of, or rejoice in, your pain. Give those people a chance. Don’t isolate yourself and cut yourself off from the world. Doing so would be letting the narcissist still have control over you once they are nothing but a distant memory. Remember that the rear-view mirror is smaller than the windscreen for a reason. Focus on what is in front of you, rather than the road you have already travelled. I’m trying very hard to do this now. It is not easy at all I have a lot of anger against my abuser. I still find myself missing him. But I have to remind myself of the hell he has put me through emotionally, & physically with domestic violence which was the final result! I am at peace that I haven’t felt in many years so I do know this is the right choice for me & my children! I have been in an unhealthy relationship for 4 and a half years. Going back and forth a number of times, becausr of his manipulation and control. I would be woken up at 4am with him abusing me over the littlest things. He would accuse me of being with different men. He would say nasty things about my friends. He isolated me. Now i finally got the courage 10 days ago after domestic violence struck to call the police. Now he’s threatening me. I’m still working as i have to support my kids. But im an emotional wreck.